I had the Lumbar fusion and cervical fusion. I’ve been dealing with my back pain since 1988 and I have never found a doctor like the one that I have now. He isn’t covering up the problem, he’s trying to take care of the problem so I’m no longer in pain . He’s a great doctor, he’s understanding, he listens to my concerns and is always making sure I understand the process that we are about to do. I recommend this doctor to anyone that needs relief from their aches and pains. He is an amazing doctor. If you’re looking for a surgeon that you can trust I have found mine!!! I can’t say enough good things about Dr. Anagnost. I was in excruciating pain had no insurance. I didn’t think I had much of a future ahead of me. Then my primary doctor referred me to Dr. Anagnost. For a fraction of the cost that I was expecting, he was able to do my surgery and it has changed my life and my future outlook. God bless you, Dr. Anagnost for what you do. I truly believe you are doing the Lord’s work. I’m so thankful for Dr. Anagnost! He accurately diagnosed a herniated disc and spinal fracture that had been causing me a great deal of pain and loss of function. After a quick, minimally-invasive outpatient surgery, I am back to normal! Thank you Dr. Anagnost and nurse Kathy for your excellent care! We highly recommend Dr. Anagnost. He has truly been a blessing to us. He cares for his patients and we feel he wants to do what is best for them. He explains the procedure and what to expect. He has a GREAT personality and bedside manner. His staff was also very helpful. We feel he will do a great job and truly care for his patients. Highly Recommend!!!! My husband recently had back surgery done. He was in excruciating pain could not hardly walk. so we were referred to Doctor Anagnost. His suggestions to us was to do the smaller surgery first because you at least had another option to fall back on if this surgery did not correct the back pain. We are so glad that he recommended this because you would not believe how much better my husband is doing he is able to do things he that he couldn’t do before the surgery. 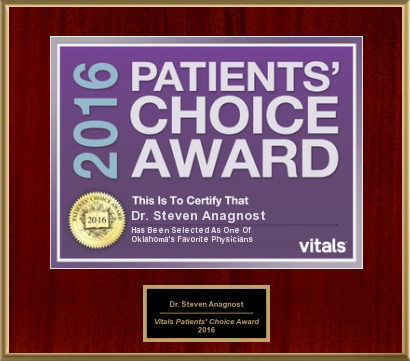 My husband recommends Dr. Anagnost very highly to anyone who is having severe back pain. We would like to Thank Dr. Anagnost for his care and kindness. Dr. Anagnost performed a miracle on my lower back about 2 months ago. I should be in a wheelchair, instead, I have my life back. I am able to do just about anything I feel like doing. This is simply amazing. In 2015 I went to the “other guys”, who I have deep respect for. I was sent out for an MRI, and basically told that my only option was to have fusion and that would only give me relief for a few years with lots of restrictions. I opted to do nothing, and I am so happy that I did! My wife had been to Dr. Anagnost about 15 years ago and had a minimally invasive procedure that was extremely successful. Now, 2018, because of inactivity and only being to sit on my rear all the time my weight had climbed to 300 pounds. My back was miserable. To make a long story short, I set up an appointment with Dr. Anagnost, we talked, he sent me to PT and pain management, because I wanted to go slow with this. My back wasn’t getting better, pain management sent me for another MRI. I showed the physical therapist the MRI who immediately told me to set up an appointment with Dr. Anagnost. I set the appointment. Meanwhile, the pain management Dr. told me the results and asked me if I had an appointment with a surgeon. When Dr. Anagnost saw the MRI he recommended that we act quickly with a minimally invasive surgery to remove a large cyst, bone spurs, etc., a week later I was in surgery. It turns out that my spinal cord was pinched so badly that it looked like an hourglass, pinched down to the size of a pencil lead. While Dr. Anagnost was cleaning out the rest of the crud in my spine he noticed that my spinal cord was returning to normal. In recovery, he told me that it was nothing short of a miracle that I was not paralyzed! What a miracle, I thank my Heavenly Father for the blessing of Dr. Steven Anagnost in my life. Because of the success of this surgery, I have been able to lose 50 lbs., so far, and continue to feel better every day.Thank you Dr.Anagnost, you are the best! My name is Sally Melinda Hatfield. I fell thirty five feet i broke my back in twenty two places. As years went on my neck really hurt. My primary dr. told me about this Dr. STEVEN ANAGNOST. He did surgery and in one hour I was up. This was a serious surgery. It came out wonderful. I can turn my head side to side. I have zero pain. My family and friends are so thankful and so very impressed..My hat truly goes off to this Doctor…..also to his nurses that helped me stay so relaxed and I praise him. Thank you Dr. Steven Anagnost…..In the name of Jesus thank you……Yours truly, Sally Hatfield. I’ve had a lot of pain in my neck, back and lumbar area for years. Finally I got tired of hurting. My Dr. made an appointment for me with Dr. Anagnost and he said I needed surgery. He first did the neck area with invasive surgery and I am now healing from the invasive surgery done on my Lumbar area, no pain in my legs and I can walk standing straight and not hunched over. In early 2004 I was diagnosed with degenerative disk disease in my lower back. I have a very active lifestyle and was determined not to have my back issues limit my quality of life. I postponed getting my issue resolved until the effects of pain were impacting not only me, but my family as well. I did research and narrowed a list down to three surgeons whom my wife and I interviewed. I was intrigued by Dr. Anagnost not only by his ability to communicate, but the time he spent getting to know me, the activities that bring quality to my life and taking those attributes into consideration when discussing treatment options that satisfied my needs as a person and not just a patient with a back issue. Surgery was the last option to be considered but after several months of physical therapy and spinal injections, it was apparent that minimal invasive surgery may be my best option. In June of 2005, I decided to undergo a lumbar stabilization and decompression at L5-S1 in the care of Dr. Anagnost. To this day, I mark this decisions as one of the best I have ever made in my life. Hours after the procedure, I remember keeping the nurses constantly busy by taking me for walks through the hospital because I wanted to keep moving around before the back pain came back, but it never did. Four months later I was successfully hunting elk at 9800 ft. in the mountains of New Mexico. Through carful communication and a complete understanding of my expiations and needs, Dr. Anagnost utilized his knowledge and skill sets to provide me a life worth living and a life well lived by my family for the past 13 years. Again, I did my research, visited other surgeons in the Tulsa area and made what I felt was the best decision that fit my expectations and goals. Fast forwarding to the present, I’m in my early 50s with the mind of an indestructible 17-year-old. I started having constant and mildly increasing back pain over the past 18 months. l worked my way through it as best I could until I decided to get it checked out. The MRI results indicated the procedure completed by Dr. Anagnost in 2005 is in great shape with no indications of any issues, but I do have a new area of degenerative disk disease at L4-L5. Many surgeons when recommended and my wife and I started the research process again in December 2017. We interviewed a few surgeons and made office visits. Again, the experience we had with Dr. Anagnost, his staff, the receptionist and waiting room area were more down to earth and personable. Once again, Dr. Anagnost took the time understand my goals, reviewed my current condition, reminded me that I’m not 17, and together we agreed on a path forward with a conservative emphasis on avoiding surgery. After two weeks of physical therapy, one spinal injection and learning new ways to approach my active lifestyle, I am for the most part pain free again and looking forward to a life worth living. Thanks for providing me a way to have my life back. He’s an amazing Dr did a wonderful job on my mom’s back and recommend everyone to go to him for your back surgery my mom is very pleased. Thank you, Dr. Anagnost, you did a wonderful job! Dr. Anagnost fixed my back . Listened to my concern and answer all my questions before and after surgery. The nurse staff was very good to me. I would like to recommend to anyone who needs his service to call his office. He is number one in my books. I WOULD JUST LOVE TO THANK DOC ANAGNOST AND HIS AMAZING STAFF FOR “FIXING” me!!!! I was pretty nervous about having surgery, but I tell you something right now, my God, is an Awesome God for putting Doc A in my path to wellness. He put a cage around my C-5,6 and 7, took things out, put things in, (I’m sorry, I can’t recall the medical names) but my bones just crumble. I’m a 52 year woman and smoker since I was 12… and we always assume that your lungs are what we need to take care of with the tobacco, but tobacco ALSO damages your bones very badly!!! People, let me tell you this, the pain that you feel before the surgery is bad enough, but the healing pain is worse, time consuming, and just bad (with normal invasive surgery.I’m only 28 days post op (with the minimally invasive surgery) and my body for the first time in a very long time, doesn’t hurt anywhere near as bad as it did!!! Of course, you know you have to endure pain before you can heal and MY WONDERFUL, Doc “A” well, I’m so very blessed for him!!! I know my quality of life will be better, as long as I follow the rules. Doc Anagnost, and your AWESOME And AMAZING staff, THANK YOU from the bottom of my heart for all that you have done for me and continue to do for me. I most definitely would encourage anyone with these kind of health issues go visit with him. If I could give more stars, let me tell you people, keep Doctor Anagnost and his staff in mind!!! I LOVE these guys and they all TRULY CARE ABOUT THEIR PATIENTS. I had surgery on my spine one month ago yesterday and I feel great! Dr Anagnost and staff were wonderful. My neck pain was so severe before the surgery that I would vomit at times from the pain, but I have literally no pain today in my neck. If I could give Dr Anagnost 10 stars I would, he is truly amazing!! I have had major problems with my back for years. I could not get anyone to help me until I met Dr Anagnost. He did the tiny band aid surgery that really helped. I am glad I did it. Dr Anagnost takes really good care of me. My back pain and leg pain were so severe I was losing function into my leg. Dr Anagnost showed me the MRI showing the severe pressure on my spine and nerves. He made a plan to help me right away. I am glad he is my doctor. Dr Anagnost performed neck surgery on me. It really helped. I was up walking right away. I am very happy I had the operation done with Dr Anagnost. Dr Anagnost clearly had my husband’s best interest in mind during his recent neck surgery. We were very pleased with his minimally invasive approach. My husbands neck pain, with which he had suffered for years, is now gone! My husband and I both use his services and we are beyond impressed with our experience with Dr. Anagnost. His demeanor is thorough, attentive and personal. I am very trusting and comfortable due to his philosophy of life and medicine. He is by far one of the best doctors I have ever seen and nothing that I can say really does justice to the man. I have recommended him and his staff to anyone in need and will continue to do so. His medical knowledge is encyclopedic and he is extremely caring. I have no more pain. I had back surgery with Dr Anagnost and I am glad I did. Dr Anagnost has helped me get my life back. I had back surgery about 15 years ago with Dr Anagnost. It really helped. I am still doing well now. He did a great job. I recommend him highly. I had previous surgery with another surgeon. I was still hurting so my doctor sent me to Dr Anagnost for a second opinion. I am glad I did. He found the problem and fixed it right away. I am glad I got to meet Dr Anagnost and how much he has helped me. I am a Chiropractor and I have had pain for years. I was able to treat and help myself for years . Eventually the pain got too bad. I have sent patients to Dr Anagnost for years, and now I was his patient. He did band aid back surgery on me and I was better immediately. Dr Anagnost did great.